Considering that humans capture more than 3 million tons of shrimp each year, it is easy to forget that they are important food sources for other species as well. In actuality, many different species rely on shrimp as a food source -- especially fish. Dwelling in oceans, rivers, lakes and marshes, shrimp are important components of the world’s aquatic ecosystems. Unfortunately for shrimp, their predators are legion, no matter where they dwell. Marine biologists debate the details of shrimp classification. Approximately 2,000 species bear the colloquial name “shrimp” or “prawn,” but these terms do not reflect natural groups. The various species inhabit different aquatic habitats, from surface waters to the dark depths, and in fresh, brackish and marine ecosystems. Most shrimp species are small, though the largest species approach 1 foot in length and may weigh more than 1 pound. 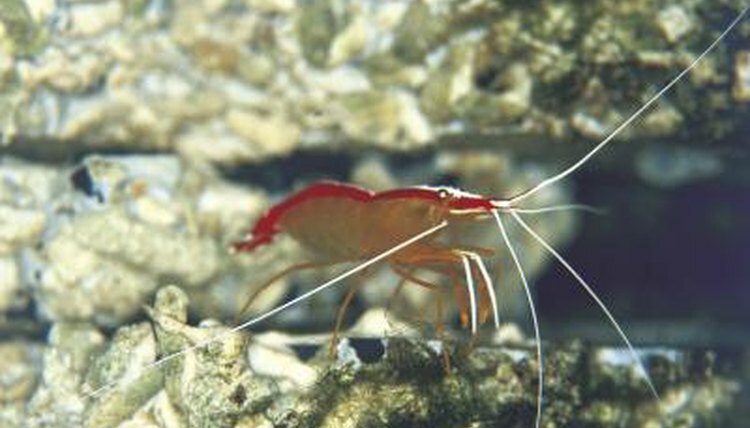 Though a few species are predators, most shrimp are herbivores or scavengers. Many small and medium-sized fish of the open ocean hunt and eat shrimp, including both the Atlantic (Gadus morhua) and Pacific cod (Gadus macrocephalus). Tiny species, such as American herring (Clupea harengus), consume a large number of small and larval shrimp. Even the two largest fish in the ocean, the basking (Cetorhinus maximus) and the whale shark (Rhincodon typus) filter some shrimp from the water during the course of their travels. Shrimp are important prey species along the ocean floor, as well. Atlantic croakers (Micropogonias undulatus), thornbacks (Platyrhinoidis triseriata) and southern stingrays (Dasyatis americana) all prowl the bottom, eager to capture unsuspecting shrimp. Pipefish (Syngnathus spp.) species lurk amid clumps of grass or vegetation, camouflaging seamlessly as they wait to ambush passing shrimp. Many bottom dwelling flat fish also prey on shrimp, including southern flounders (Paralichthys lethostigma) and Greenland halibut (Reinhardtius hippoglossoides). Some sharks hunt the ocean floor as well, including carpet sharks of the family Orectolobidae. Far beyond the reach of light, shrimp of the abyss face an assortment of deep-sea predators. Noteworthy among the predators are viperfish (Chauliodus spp.). Nightmarish creatures of the deep, viperfish bear a protruding set of needle-like teeth that they use to capture prey. However, some shrimp have evolved spectacular defense mechanisms that protect them from viperfish and other predators of the deep. Some shrimp have bioluminescent capabilities -- if attacked by a predator, they will vomit a brightly lit mass into the predator’s face, and quickly slip away in the dark.